Real Estate Exam Prep from Florida’s #1 Real Estate School! With our Exam Tutor software, we’ve taken the guesswork out of preparing for your exam by focusing only on the content you’ll encounter on test day. Not only do you get to see the correct answers for questions, but you will also be given the rationale behind why it is the correct answer. You will also be provided scores for your selection of questions so that you track your learning progress. Click a link below to purchase our Larson Exam Tutor products. Your purchase is good for 120 days or until all questions have been answered, whichever comes first. Welcome to Larson Exam Tutor! 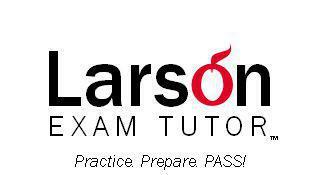 Click a link below to purchase our Larson Exam Tutor products. Your purchase is good for 120 days or until all questions have been answered, whichever comes first. Florida real estate school Larson Educational Services has the best exam tutor software in the industry.